Mudworks Pottery is the studio of clay artist Sherri Jo Adams. Sherri Jo began her pottery by taking classes from two established potters and then continuing to study independently. Since that time Sherri Jo has won awards in juried competitions, and recognized in regional magazines. She teaches beginning to advanced wheel lessons for adults, works on numerous custom orders, and makes her work available through galleries and art festivals. Sherri Jo’s inspiration comes from her faith and the works of all artists’, no matter what the medium. She enjoys creating forms that can be used and shared among family and friends for generations. She wants her art to be recognized for the love and hope she has for life, and her belief in traditions. Where ever we traveled I always gravitated to pottery, mostly functional, to purchase keepsakes. My husband would always comment, “Oh you can make that”, even though I had never touched clay! In 1998 he bought me a wheel and 6 lessons as a Christmas gift. 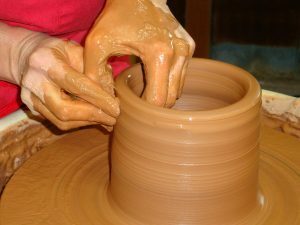 I quickly learned that working on a wheel to make pots was a talent that God had given me. By 1999 I was teaching classes and selling my work at art festivals. Currently I have 18 students in my Boerne Studio and have my work available through galleries and art festivals.